Princess Cruises will now be showing all the Monday night Football on-board all cruise ships which are departing from the US. The football will be shown on the large open deck screen known as “Movies Under the Stars”. The cruise line will also be throwing a party to celebrate the games every week. 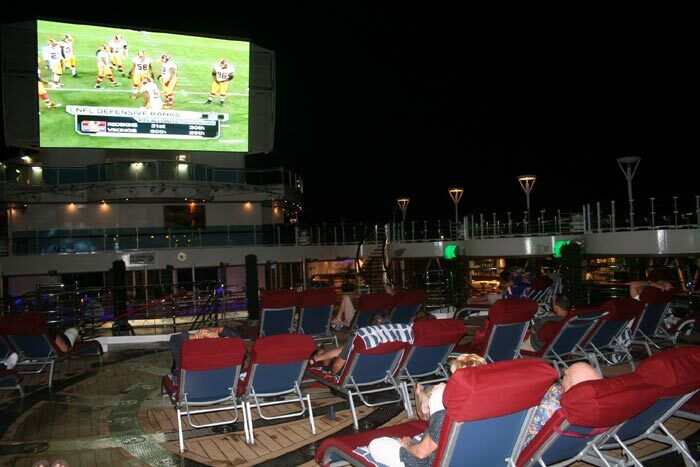 The screen is very large and lots of passengers will be able to watch all the games while sailing at sea! Guests will also be able to relax on the lunge chairs while watching the large LED screen. The party which Princess Cruises will host will be called the Tailgate Party and will compliment the Monday night games. Passengers will be able to enjoy great traditional snacks for watching the American football games including hot dogs, chicken wings, chips and salsa, burgers and even pizza. There will also be beer deals and other snacks which you would find at any game event. “Movies Under the Stars” screen is a popular feature on-board Princess cruise ships and was in fact the first cruise line to introduce a large screen on the open deck. Many more cruise lines are now having these screens on-board which are also used for major entertainment events and of course movies.